The system uses our general position system using radio and ultrasound. GT-Xconnect takes care of the signalling and position registration. The PC makes all calculations, set-up, tracking on screen, and data streaming. 4 satellitter in the corners of the room cover about 6x6 meter, you can add more satellites to cover bigger areas. Senderen is a 3 grams unit with a transmitter and radio on board. To be used for a small drone/quadrokoper like Hubsan or robots. Use the handheld sender for manual calibration and testing. 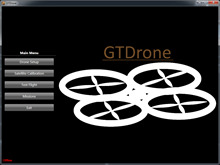 If you have bigger drones and bigger areas then look at our GT-XL drone sender. If you hav a bigger area you can order extra satellites, item 1302811/12 are recommended for drone positioning. About 1 extra satellite for extra 20 m2. If you need to cover longer distances or you use robots on the floor, or you want to draw the manufacturing hall with all its installations you might want to add GT-Xcontrol XL with triple-head Item 1302716 and the long range Calibrator Item 1302791.